Now it’s up to Taylor to uncork this open-bottle mystery before more blood is spilled. As soon as I saw this cover I knew I had to read this book. 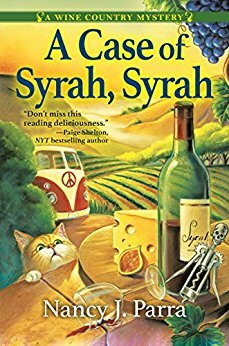 Yes, the wine, the vineyard, and the VW bus, but it was the cat the really caught my attention. Look at those eyes. I was happy to learn there is a canine in the story too. Taylor O’Brian’s Aunt Jemma was having “heart problems” so she asked Taylor to come to her winery to help run the place. There are other employees and Aunt Jemma is still very hands-on with the winery so Taylor doesn’t have to spend all her time there. She has decided to put her marketing knowledge to the test by opening “Taylor’s Off The Beaten Path Wine Tours”. She doesn’t get off to a good start. As the group was wrapping up the first stop they discover one of the guests was missing. A quick search finds the woman dead with Taylor’s corkscrew plunged into her neck. Taylor believes there are plenty of other suspects including the woman’s husband but he is telling everyone she is the murderer. It is not long before another dead body is found by none other than Taylor. Taylor needs to save herself, her reputation, and her business. Hopefully, she doesn’t have to do that from behind bars. Ms. Parra has introduced us to several characters in the first story. The all seem genuine and I hope the characters develop more fully as the series continues. Taylor really is her own worse enemy. The hot water she found herself in time and time again was because of her poor judgment. I understand the whole amateur sleuth thing but she really made some poor choices. I hope that she has learned something for the future cases. Aunt Jemma is quite a woman and while the way she brought Taylor to the winery was a little shady, she is my favorite character in the first installment. She reminds me of my own mother in many ways. We barely have scratched the surface on the other characters but am excited to get to know them better. The plot was truly puzzling. The murderer had to be someone on the tour, didn’t it? Taylor learned more about the group every day and a variety of motives were uncovered. I didn’t put all the pieces together until the very end. Twists, turns, red herrings, this story has them all. The setting was extraordinary, Sonoma, wine country, the vineyards and the gardens. I have always wanted to visit and this author gave me an excellent virtual trip. This series has a lot going for it with plenty of potential. The area is full of wineries to visit no matter what direction Taylor takes her business. As the characters continue to evolve this series will have no bounds. I have enjoyed everything this author has written and I am looking forward to my next trip to Sonoma.